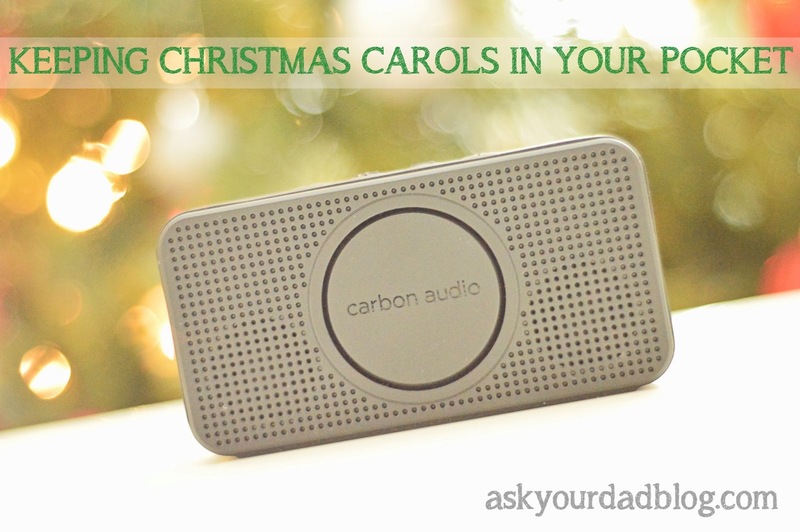 As most of you know, I get paid to try out various products from time to time This month I got the opportunity to try out the extra small, extra loud, and remarkably portable pocket speaker by Carbon Audio. It's currently available exclusively for purchase in all of the brick and mortar Apple Store and on line. It is also, and I say this without hesitation and under no influence of the fact that I get paid for this, a really nice product. The first thing I noticed when I picked up the box was its weight. 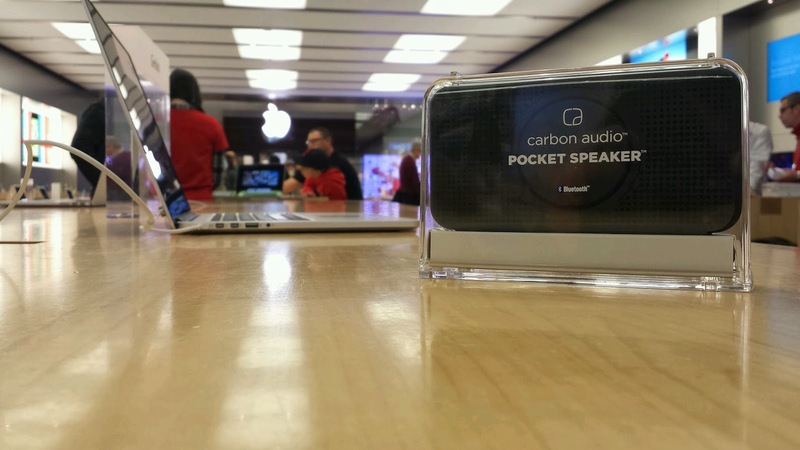 The speaker weighs 5.8 ounces, but it felt solid in my hand. It has a rubber colored lining that gives it traction and allows you to set the speaker on pretty much any surface. And with it's portable size 2.6 by 0.9 by 5.1 inches (Height, Width, Depth) there were plenty of surfaces within reach to try it out on. The speaker syncs wirelessly through Bluetooth to both Apple and Android phones. We could control the volume through our phones, and if either one of us received a call while using the speaker, we had the option to convert it to a speaker phone. It is ridiculously cool, and for the $99 price point it would be a wonderful gift to any music lover. Over the last week it has been playing nothing but Christmas music in our house. The speaker holds an 8 hour charge and we've had to charge it at least three times. Duchess is kind of nuts for Christmas music right now. She is also VERY into dancing. Now we can dance in every room! With a powerful, built-in microphone, T4R ROCK BOX enables you to share perfect, clean-sounding conference calls anywhere – in the office, car, at home, and at school. 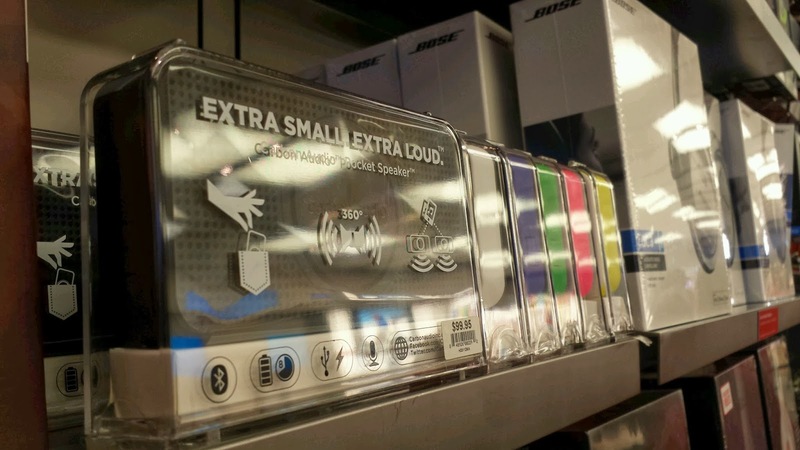 You can have wireless hands free calls anywhere.